Western blot analysis of extracts from 293T cells, mock transfected (-) or transfected with constructs expressing GFP-tagged human Atg14 protein (hAtg14-GFP; +) or mouse ULK1 protein (mULK1; +), using Phospho-Atg14 (Ser29) (D4B8M) Rabbit mAb (upper), Atg14 (D1A1N) Rabbit mAb (middle), or β-Actin (D6A8) Rabbit mAb #8457 (lower). 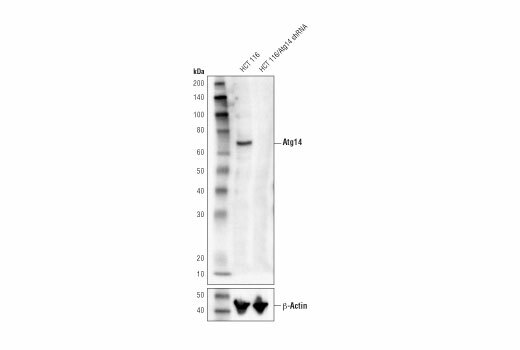 Western blot analysis of extracts from HCT 116 and HCT 116/Atg14 shRNA knockout cells using Atg14 (D1A1N) Rabbit mAb (upper) and β-Actin (D6A8) Rabbit mAb #84576 (lower). HCT 116/Atg14 shRNA cells were kindly provided by Dr. Do-Hyung Kim, University of Minnesota, Minneapolis, MN. 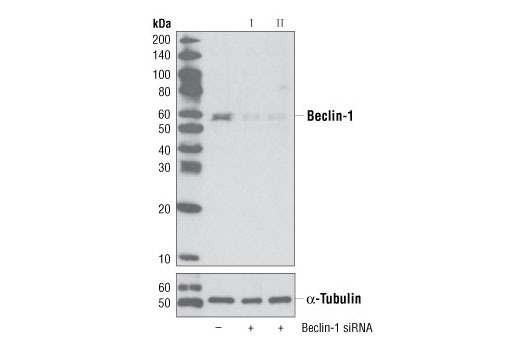 Western blot analysis of extracts from 293T cells, mock transfected (-) or transfected with constructs expressing full-length human Beclin-1 protein (hBeclin-1; +), mouse Beclin-1 protein (mBeclin-1; +), or mouse ULK1 protein (mULK1; +), using Phospho-Beclin-1 (Ser15) (D4B7R) Rabbit mAb (upper), Beclin-1 (D40C5) Rabbit mAb #3495 (middle) or β-Actin (D6A8) Rabbit mAb #8457 (lower). 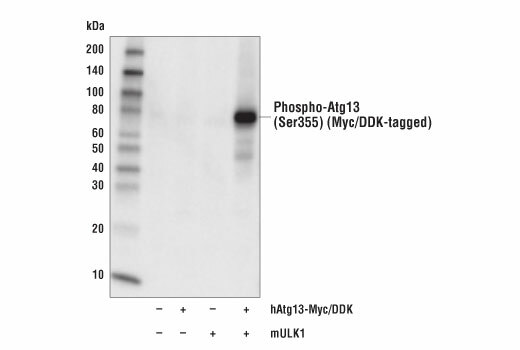 Western blot analysis of extracts from 293T cells, mock transfected (-) or transfected with a construct expressing Myc/DDK-tagged full-length human Atg13 (hAtg13-Myc/DDK; +) or mouse ULK1 (mULK1; +), using Phospho-Atg13 (Ser355) (D6J1W) Rabbit mAb. 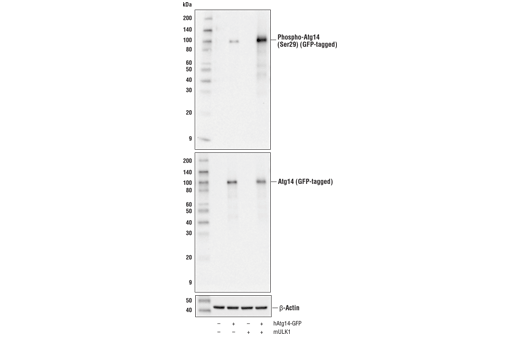 Western blot analysis of extracts from RD, PANC-1, and A20 cells using Atg13 (D4P1K) Rabbit mAb. 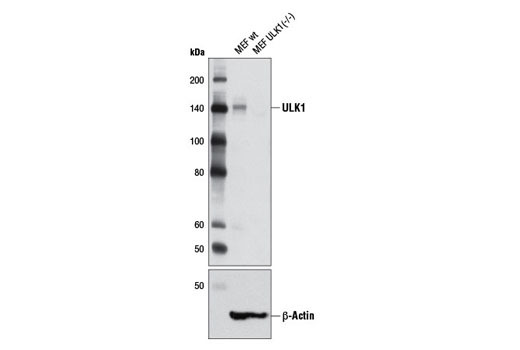 Western blot analysis of extracts from various cell lines using ULK1 (D8H5) Rabbit mAb. 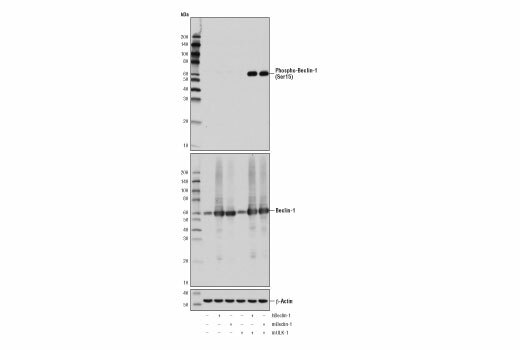 Western blot analysis of extract from A172 cells, untreated (-) or treated with mTOR inhibitors, either Torin-1 (250 nM, 5 hrs), Torin-2 (250 nM, 5 hrs), or INK128 (250 nM, 5 hours) using Phospho-ULK1 (Ser757) (D7O6U) Rabbit mAb (upper) or ULK1 (D8H5) Rabbit mAb #8054 (lower). 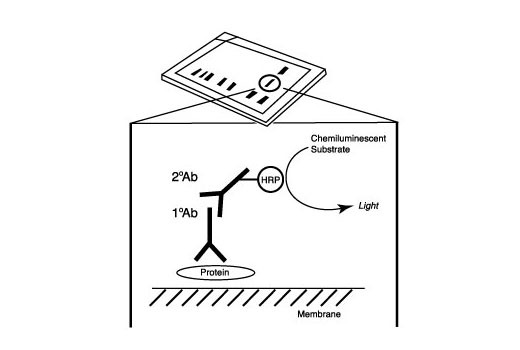 Western blot analysis of extracts from MCF7 cells, untreated or treated with oligomycin #9996 (0.5 μM, 30 minutes), and C2C12 cells, untreated or treated with hydrogen peroxide (10 mM, 5 minutes), using Phospho-ULK1 (Ser555) (D1H4) Rabbit mAb. Western blot analysis of extracts from HCT 116 and HCT 116/Atg14 shRNA knockout cells, untreated (-) or starved using Earles Basic Salt Solution (EBSS, 2 hr; +) and the ULK1 inhibitor SBI-020695 #29089 (50 μM, 2 hr; +) as indicated, using Phospho-Atg14 (Ser29) (D4B8M) Rabbit mAb (upper), Atg14 (D1A1N) Rabbit mAb #96752 (middle), or β-Actin (D6A8) Rabbit mAb (lower). HCT 116/Atg14 shRNA knockout cells were kindly provided by Dr. Do-Hyung Kim, University of Minnesota, Minneapolis, MN. 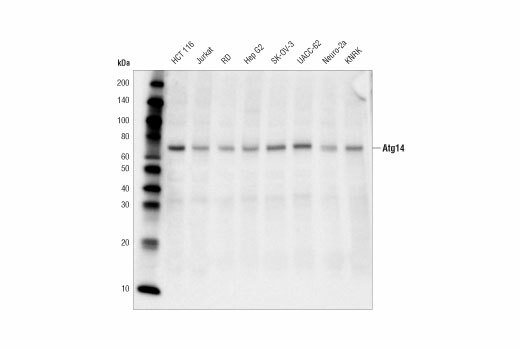 Western blot analysis of extracts from various cell lines using Atg14 (D1A1N) Rabbit mAb. Immunoprecipitation of Phospho-Atg13 (Ser355) from extracts of PANC-1 cells starved with Hank's Balanced Salt Solution (HBSS) (2 hr). Lane 1 is 10% input, lane 2 is Rabbit (DA1E) mAb IgG XP® Isotype Control #3900, and lane 3 is Phospho-Atg13 (Ser355) (D6J1W) Rabbit mAb. 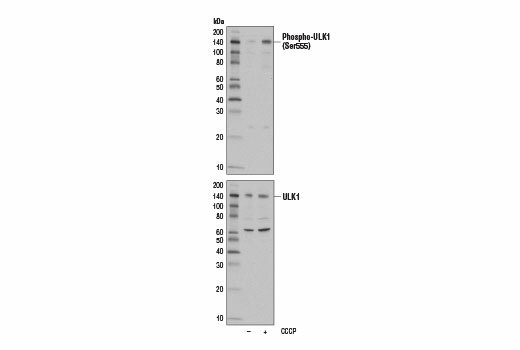 Western blot was performed using Phospho-Atg13 (Ser355) (D6J1W) Rabbit mAb. 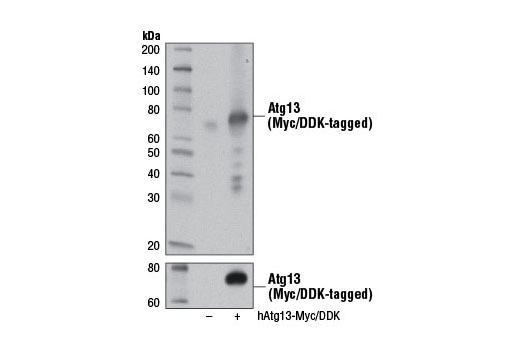 Western blot analysis of extracts from 293T cells, mock transfected (-) or transfected with a construct expressing Myc/DDK-tagged full-length human Atg13 (hAtg13-Myc/DDK; +), using Atg13 (D4P1K) Rabbit mAb (upper) or Myc-Tag (71D10) Rabbit mAb #2278 (lower). Western blot analysis of extracts from wild-type MEF and ULK1 (-/-) MEF cells using ULK1 (D8H5) Rabbit mAb (upper) and β-Actin (D6A8) Rabbit mAb #8457 (lower). MEF cells were kindly provided by Dr. Reuben Shaw (Salk Institute, La Jolla, CA). 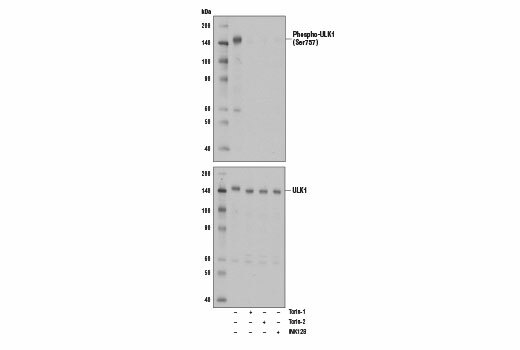 Western blot analysis of extracts from various cell lines using Phospho-ULK1 (Ser757) (D7O6U) Rabbit mAb. Western blot analysis of extracts from MCF7 cells, untreated or treated with oligomycin #9996 (0.5 µM, 30 minutes), using Phospho-ULK1 (Ser555) (D1H4) Rabbit mAb (left). 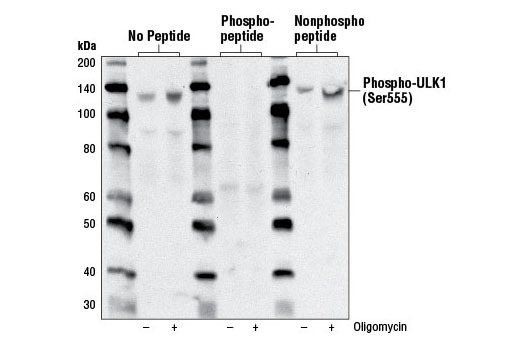 Phospho-specificity is demonstrated by pre-incubating the antibody with phosphorylated (middle) or non-phosphorylated peptides (right) against a region surrounding Ser555 of ULK1. 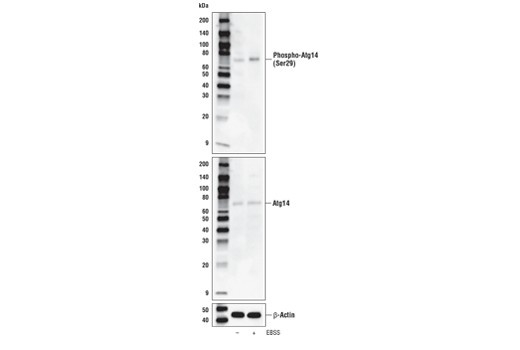 Western blot analysis of extracts from HCT 116 cells, untreated (-) or treated with lambda-phosphatase and calf intestinal phosphatase (λ-phosphatase/CIP; +), using Phospho-Atg14 (Ser29) (D4B8M) Rabbit mAb (upper), Atg14 (D1A1N) Rabbit mAb #96752 (middle), and β-Actin (D6A8) Rabbit mAb #8457 (lower). Immunoprecipitation of Atg14 from HCT 116 cell extracts. Lane 1 is 10% input, lane 2 is precipitated with Rabbit (DA1E) mAb IgG XP® Isotype Control #3900, and lane 3 is Atg14 (D1A1N) Rabbit mAb. 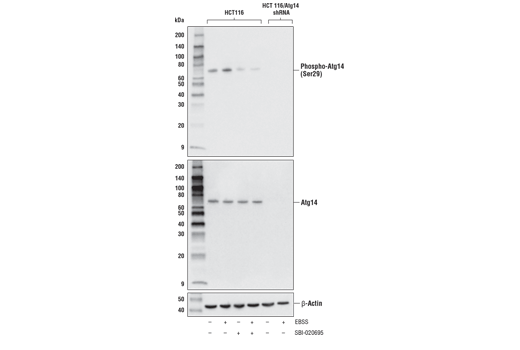 Western blot was performed using Atg14 (D1A1N) Rabbit mAb. 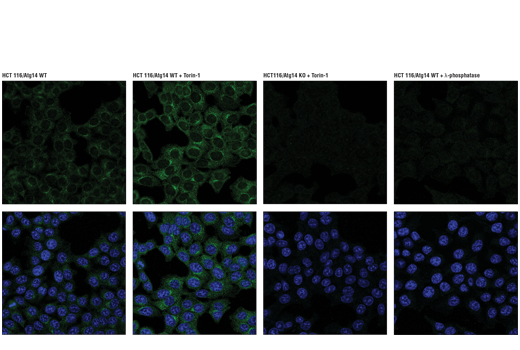 A confirmation specific secondary antibody was used to avoid reactivity with IgG. 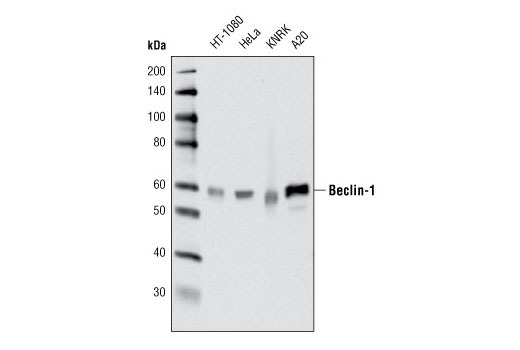 Western blot analysis of extracts from HeLa cells, transfected with 100 nM SignalSilence® Control siRNA (Unconjugated) #6568 (-) or SignalSilence® Atg13 siRNA I #12043 (+), using Atg13 (D4P1K) Rabbit mAb (upper) or β-Actin (D6A8) Rabbit mAb #8457 (lower). 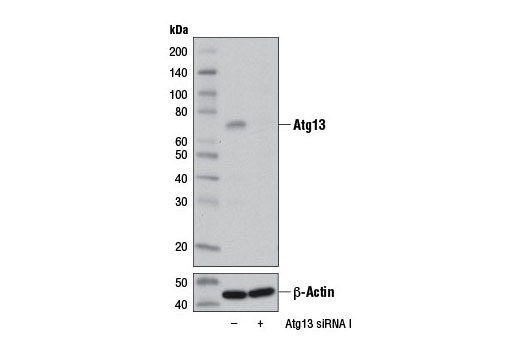 The Atg13 (D4P1K) Rabbit mAb confirms silencing of Atg13 expression, while the β-Actin (D6A8) Rabbit mAb is used as a loading control. Confocal immunofluorescent analysis of MCF7 cells, untreated (left), untreated and post-processed with λ-phosphatase (center) or treated with Torin 1 #14379 (250 nM, 5 hr; right), using Phospho-ULK1 (Ser757) (D7O6U) Rabbit mAb. Blue = Hoechst 33342 #4082 (fluorescent DNA dye). Western blot analysis of extracts from MCF7 cells, untreated (-) or treated with carbonyl cyanide 3-chlorophenylhydrazone (CCCP) (100 μM, 2 hr; +), using Phospho-ULK1 (Ser555) (D1H4) Rabbit mAb (upper) or ULK1 (D8H5) Rabbit mAb #8054 (lower). Western blot analysis of extracts from Saos-2 cells, untreated (-) or starved using Earles Basic Salt Solution (EBSS, 2 hr), using Phospho-Atg14 (Ser29) (D4B8M) Rabbit mAb (upper), Atg14 (D1A1N) Rabbit mAb #96752 (middle), and β-Actin (D6A8) Rabbit mAb #8457 (lower). Immunoprecipitation of Atg13 from RD cell extracts using Rabbit (DA1E) mAb IgG XP® Isotype control #3900 (lane 2) or Atg13 (D4P1K) Rabbit mAb (lane 3). Lane 1 is 10% input. 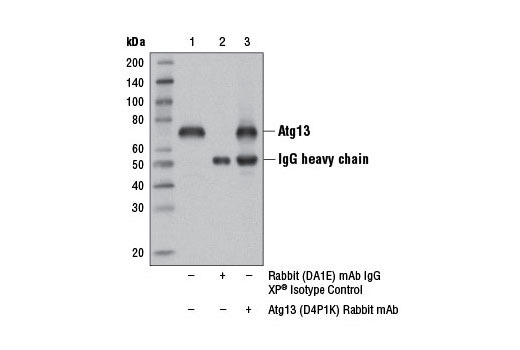 Western blot analysis was performed using Atg13 (D4P1K) Rabbit mAb. 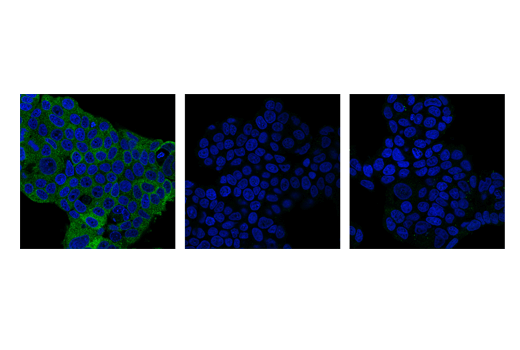 Confocal immunofluorescent analysis of HCT 116 Atg14 wild-type cells, untreated (left, low-expressing) or treated with Torin 1 #14379 (250 nM, 2 hr; middle-left, high-expressing), HCT 116/Atg14 shRNA knockout cells treated with Torin 1 (middle-right, negative), or HCT 116 Atg14 wild-type cells post-processed with λ-phosphatase (2 hr; right, negative), using Phospho-Atg14 (Ser29) (D4B8M) Rabbit mAb (green). Samples were mounted in ProLong® Gold Antifade Reagent with DAPI #8961 (blue). HCT 116/Atg14 shRNA knockout cells were kindly provided by Dr. Do-Hyung Kim, University of Minnesota, Minneapolis, MN. 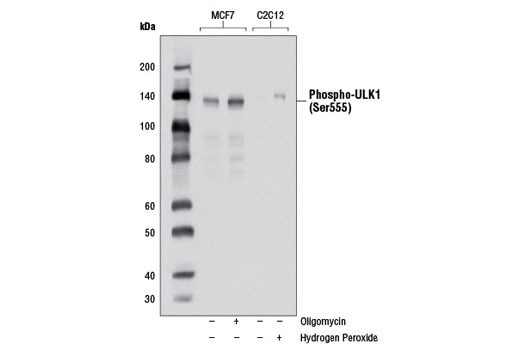 The ULK1 Substrate Antibody Sampler Kit provides an economical means of detecting the activity of ULK1 using phospho-specific and control antibodies. The kit includes enough antibody to perform two western blot experiments with each primary antibody. 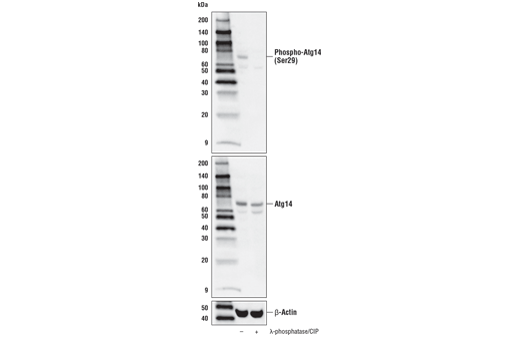 Phospho-Beclin-1 (Ser15) (D4B7R) Rabbit mAb and Phospho-Atg13 (Ser555) (E6H1W) Rabbit mAb are only recommended for transfected levels of their specific targets. 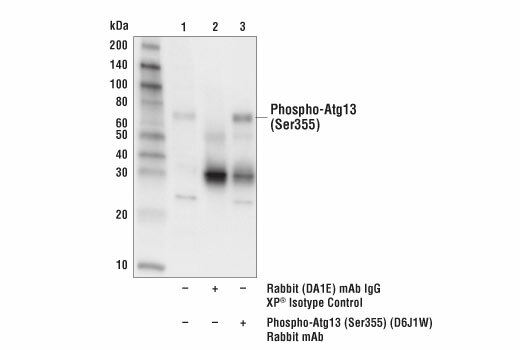 Phospho-Atg13 (Ser555) (E6H1W) Rabbit mAb can weakly detect endogenous levels of phosphorylated Atg13, but also reacts with a band of unknown origin at 25 kDa. 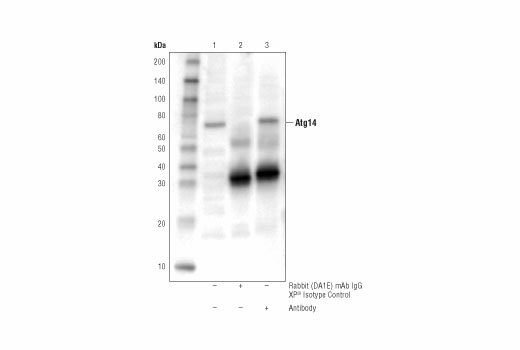 All other antibodies in the kit can detect endogenous levels of their specific targets. 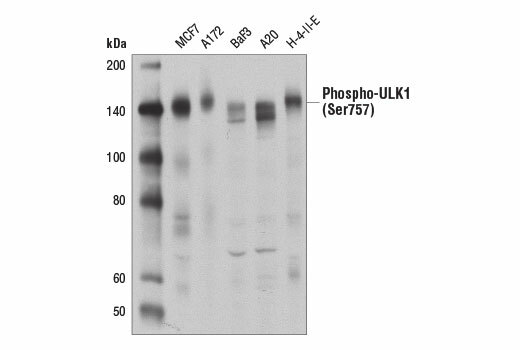 Phospho-ULK1 (Ser555) (D1H4) Rabbit mAb detects a band of unknown origin between 90 and 100 kDa. Monoclonal antibodies are produced by immunizing rabbits with synthetic peptides corresponding to residues surrounding Arg70 of human Atg14, Thr72 of human Beclin-1, Asp462 of human Atg13, and Arg600 of human ULK1. Phosphorylation-specific monoclonal antibodies are produced by immunizing rabbits with synthetic phospho-peptides corresponding to Ser29 of Atg14, Ser15 of human Beclin-1, Ser355 of human Atg13 (Ser318 of isoform 2 of Atg13), Ser555 of mouse ULK1 (equivalent to Ser556 of human ULK1), and Ser757 of mouse ULK1 (equivalent to Ser758 of human ULK1). Two related serine/threonine kinases, UNC-51-like kinase 1 and 2 (ULK1, ULK2), were discovered as mammalian homologs of the C. elegans gene UNC-51 in which mutants exhibited abnormal axonal extension and growth (1-4). Both proteins are widely expressed and contain an amino-terminal kinase domain followed by a central proline/serine rich domain and a highly conserved carboxy-terminal domain. The roles of ULK1 and ULK2 in axon growth have been linked to studies showing that the kinases are localized to neuronal growth cones and are involved in endocytosis of critical growth factors, such as NGF (5). Yeast two-hybrid studies found ULK1/2 associated with modulators of the endocytic pathway, SynGAP and syntenin (6). Structural similarity of ULK1/2 has also been recognized with the yeast autophagy protein Atg1/Apg1 (7). 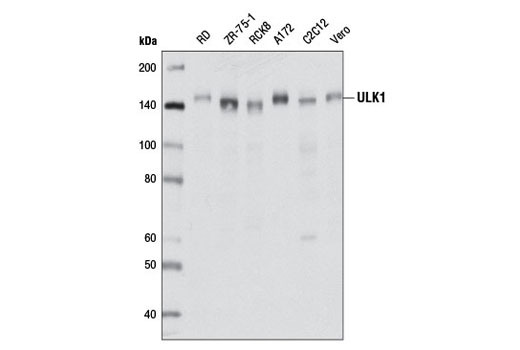 Knockdown experiments using siRNA demonstrated that ULK1 is essential for autophagy (8), a catabolic process for the degradation of bulk cytoplasmic contents (9,10). 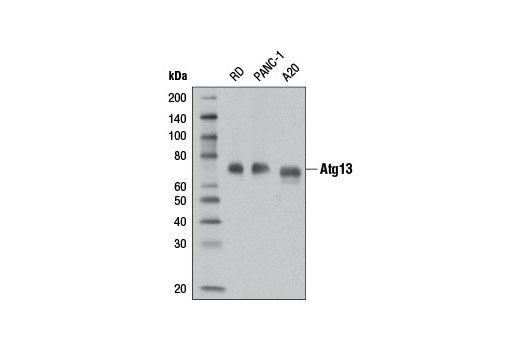 It appears that Atg1/ULK1 can act as a convergence point for multiple signals that control autophagy (11), and can bind to several autophagy-related (Atg) proteins, regulating phosphorylation states and protein trafficking (12-16). AMPK, activated during low nutrient conditions, directly phosphorylates ULK1 at multiple sites, including Ser317, Ser555, and Ser777 (17,18). Conversely, mTOR, which is a regulator of cell growth and is an inhibitor of autophagy, phosphorylates ULK1 at Ser757 and disrupts the interaction between ULK1 and AMPK (17). ULK1 has been shown to phoshorylate several targets in the autophagy pathway, including Ser29 of Atg14, Ser15 of Beclin-1, and Ser355 of Atg13 (19-22). Ogura, K. et al. (1994) Genes Dev 8, 2389-400. Kuroyanagi, H. et al. (1998) Genomics 51, 76-85. Yan, J. et al. (1998) Biochem Biophys Res Commun 246, 222-7. Yan, J. et al. (1999) Oncogene 18, 5850-9. Zhou, X. et al. (2007) Proc Natl Acad Sci USA 104, 5842-7. Tomoda, T. et al. (2004) Genes Dev 18, 541-58. Matsuura, A. et al. (1997) Gene 192, 245-50. Chan, E.Y. et al. (2007) J Biol Chem 282, 25464-74. Stephan, J.S. and Herman, P.K. (2006) Autophagy 2, 146-8. Okazaki, N. et al. (2000) Brain Res Mol Brain Res 85, 1-12. Young, A.R. et al. (2006) J Cell Sci 119, 3888-900. Kamada, Y. et al. (2000) J Cell Biol 150, 1507-13. Lee, S.B. et al. (2007) EMBO Rep 8, 360-5. Hara, T. et al. (2008) J Cell Biol 181, 497-510. Park, J.M. et al. (2016) Autophagy 12, 547-64. Egan, D.F. et al. (2015) Mol Cell 59, 285-97. Russell, R.C. et al. (2013) Nat Cell Biol 15, 741-50. Joo, J.H. et al. (2011) Mol Cell 43, 572-85. Kim, J. et al. (2011) Nat Cell Biol 13, 132-41. Egan, D.F. et al. (2011) Science 331, 456-61.